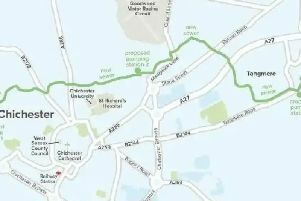 Bognor Regis Town Council has set a date for a motion to call on Arun District Council to abandon its Linear Park regeneration plan. A total of 16 councillors made the request to the council for the meeting which is set to take place at the Jenese Centre on Wednesday November 21 at 6pm. The news comes as other councillors launched formal objections to the plans. Councillor Jan Cosgrove, Labour, said: "Last Monday I attended the full council frankly expecting a quiet time and was stunned by the large number of very concerned residents who turned out to demand we take action to enable their protest against Arun's plans for a Linear Park to be heard properly by Arun council." At a town council meeting on Monday November 6, members of the public warned councillors that they would pay the 'heaviest price' at the next elections by backing proposals to replace the historic Sunken Gardens. Councillors are asking for Arun District Council to, instead of spending the projected £3.5 million on regenerating the site, spend a 'lesser yet substantial' sum on upgrading the current sunken gardens, Cllr Cosgrove has said. The list of councillors supporting the improvement of the Sunken Gardens is: Kenton Bailey, Lib Dem, Orchard Ward; Jim Brooks, Ind, Marine Ward; Jan Cosgrove, Lab allied Ind, Orchard Ward; Steve Goodheart, Ind, Hotham Ward; Martin Lineham, UKIP, Marine Ward; Martin Smith, Lib Dem, Hotham Ward; Matt Stanley, Lib Dem, Marine Ward; Bill Toovey, Lib Dem, Orchard; Jeanette Warr, Lib Dem, Hotham Ward; Phil Woodall, Con, Orchard Ward. According to councillors the motion is also being backed by the community gardeners who look after the garden. Cllr Cosgrove added: "The question for me is why spend so much money digging up and ripping out this beautiful space when for a much smaller sum we could see a wonderful upgrade to the Sunken Gardens with features at least as good as those in Arun's plans, including a long overdue town memorial to our founder and after to whom the garden and Hothampton are named."